We humans are social creatures. Relationships come quite naturally to us. So you would think that we would not only be able to make them work, but we would be really good at them. But it’s not so simple. There are seven billion people on this planet. Some of them are easy for you to get along with and you would love to have as your friend. Others are just plain difficult for you to be around. On top of it all you have family relationships to deal with, which creates a whole new set of challenges because you don’t have a choice who is in your family. And then there’s marriage. If you encounter difficulty with people you don’t live with, how are you possibly expected to get along consistently and seamlessly with your life partner—day in, day out? More than that, how do you achieve your dream and live happily ever after? In Chapter One of Radical Marriage we highlight a fundamental principle of a Radical Marriage that comes down to perspective. In other words, What you see depends upon where you’re standing and where you’re looking. Most of us don’t want to go through life alone. We want to live a life of fulfillment with the love of our life. We want that one special person or soul mate (or whatever term speaks to us) to share the human experience. In fact, it’s a particular journey that has always fascinated David because of his unhappy family and childhood and fueled his interest in becoming a Marriage and Family Therapist. So he did. As a therapist, David devoted his profession to helping people achieve a good relationship. Even when he succeeded, that was as far as it went. He couldn’t take his clients beyond good since he couldn’t see beyond good. Once his clients were no longer in danger of getting divorced, they stopped coming and he felt good about his work. He thought his work was done, because he didn’t know any better. He was never trained in what to do after helping a couple have a good relationship. More disappointing, about half the couples crumbled. David himself even got divorced twice during this period—a devastating experience for a relationship therapist. Not only did David not give up, he doubled down on his commitment and dedicated his life to studying relationships and helping other people. Regardless of how his own life was working out, he wanted to help others live happily ever after. And if he could do it while reaching for his own level of marital happiness, all the better. David’s eyes were opened reading Gay and Katie Hendricks’s book, Conscious Loving. It inspired him with possibilities. It helped him see that there is a spiritual level to relationships, a level beyond what we can see and know. He became aware that the couple relationship is the ultimate adventure in personal growth and in living life to the fullest. Fast forward to Relationship Coaching Institute, exploring relationship coaching and new possibilities for relationships, and David is standing in a different place and looking in a different direction. He applied to his own life what he learned about relationships and about singles, developed a whole relationship coaching program, and found the love of his life, his soul mate, Darlene. 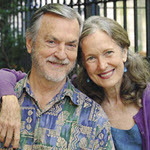 Married now for seven years, these authors have been having the grandest time exploring the possibilities for relationships. We developed Radical Marriage through our relationship as we went along. David could not have done it by himself, and he certainly could not have done it as a Marriage and Family Therapist. He’s doing this now as a relationship coach and as somebody who finally has the relationship and lifestyle that he really wants. So whether you’re standing in a place where you feel happy and satisfied with a clear view of an even brighter future, or you’re in a place where you feel frustrated and unfulfilled with only darkness on the horizon, that’s your reality. 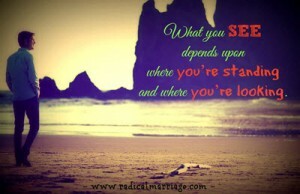 What you see depends upon where you’re standing and where you’re looking. The beauty of it all is that we have a choice where we stand and where we look. We can stand in the belief that we will never live happily ever after or that our partner is who they are and they won’t change and therefore we are stuck. Or we can stand in the possibility that a Radical Marriage is absolutely possible and we are going to do everything we can to make it happen. We can look at possibilities rather than limits. What you see depends upon where you’re standing or where you’re looking. It’s a powerful concept, and you absolutely have a choice about that. So get out there and choose to live happily ever after.